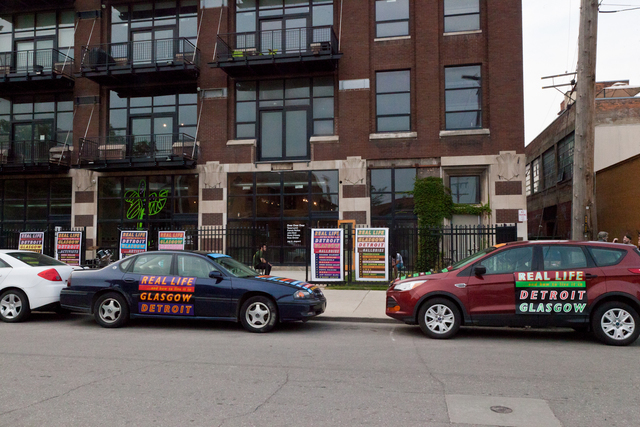 The project is a group exhibition in Detroit Michigan curated by Cedric Tai, spread over 2 venues. 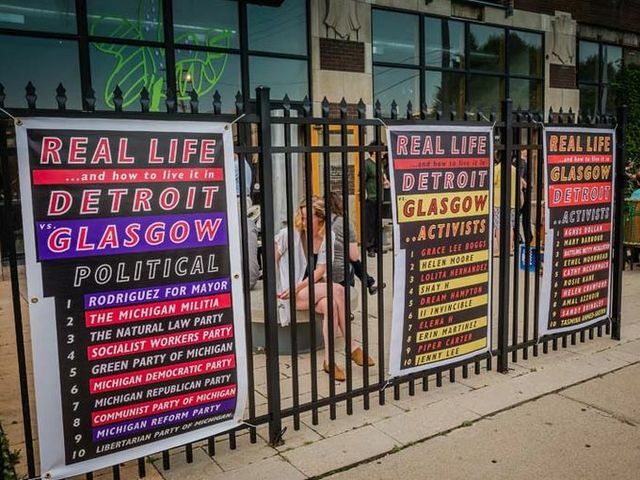 Over Over Over will serve as the first public outcome within an ongoing dialogue between Glasgow and Detroit about how artists can negotiate and sustain a practice within cities that have historically experienced comparative levels of social and economic upheaval. 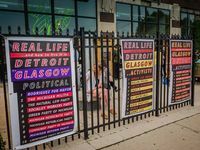 "Artist-Curator Cedric Tai invited five Glasgow-based artists, Tessa Lynch, Francis McKee, John Nicol, Rosie O’Grady, and Ross Sinclair, to Detroit for an exhibition that investigates what it means to be an artist, creating and sustaining their practices in these cities. This project is rooted in Tai’s introduction to the artistic community of Glasgow, which he saw as having similarities to Detroit’s developing art scene. 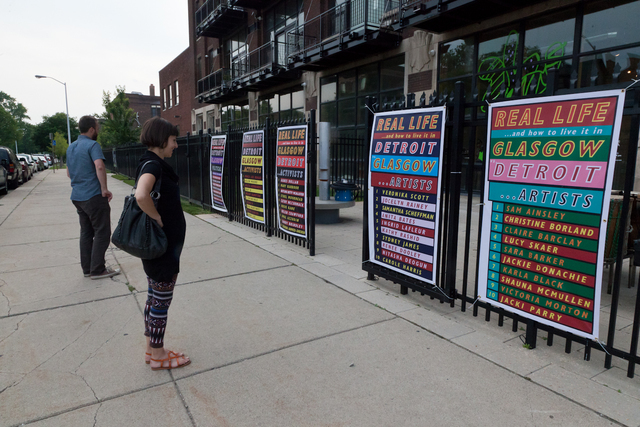 Glasgow could serve as an ideal model for artists to re-imagine Detroit’s potential. He worked to learn as much as possible by attending meetings of grassroots organizations (such as GalGael), being a part of the AHRC funded project “The Glasgow Miracle: Materials for Alternative Histories” and leading walking tours through the city of Glasgow. 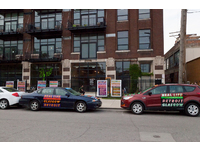 Through these actions he met the five artists in this exhibition, as co-workers, peers and collaborators. 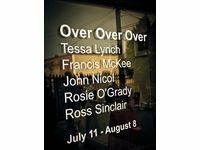 Lynch, McKee, Nicol, O’Grady and Sinclair have been invited to exhibit their work as each artist makes uncompromising work, never allowing their art to become too serious, a quality within that cultivates curiosity and critical thinking. Their process of examining the role of artists, identity, and place is steeped in abundant research. These ideas are manifested into playful works that critique voyeurism, tourism or corporatism. Where it has become an occupational hazard to become stifled by the mediated identity of a city, this project brings together people who do exceptionally well defining success on their own terms." Through the new work made for this project I wanted to interrogate the multiple identities and group dynamic of the artists selected for this ‘group show’ to explore the sense of productive camaraderie and ‘one-ness’ set against the exploration of the socio-cultural-economic tension of the perceived values of the art scenes in Glasgow vs. Detroit. Furthermore I wanted to explore paradigms of dissemination testing whether low cultural forms like pop songs and apparently anachronistic media like vinyl records/packaging can seek and find new audiences for engagement and a continued life for the art object, and exhibition, in dynamic and unusual ways. As individual artists we have all worked within and alongside many of the key institutions and artist led spaces that make up Glasgow’s artistic community and this diversity of experience and acquired knowledge will bring a wide range of perspectives to Detroit. One of the primary objectives for the project is to create a discourse around the specific working conditions of artists in Glasgow and Detroit, how these differ or resonate and what can be learned from each other, through the dialogues explored through the exhibition(s). It is my aim that the exhibition will act as a catalyst to excite and encourage a discussion that began while Cedric Tai, the curator was studying in Scotland and to engage the artists and audiences between the two places to contribute to what they believe makes it possible to sustain and develop a thriving artistic community. Then to bring this experience back to the UK for further potential discussion and articulation. The curator has recently receive a Knight Foundation award for the project. I successfully applied for an RDF award to make a publication for this project that I continue to develop. 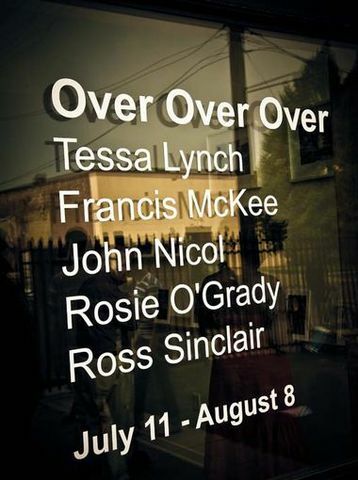 Over Over Over, Simone de Souza Gallery, Detroit, curated by Cedric Tai.